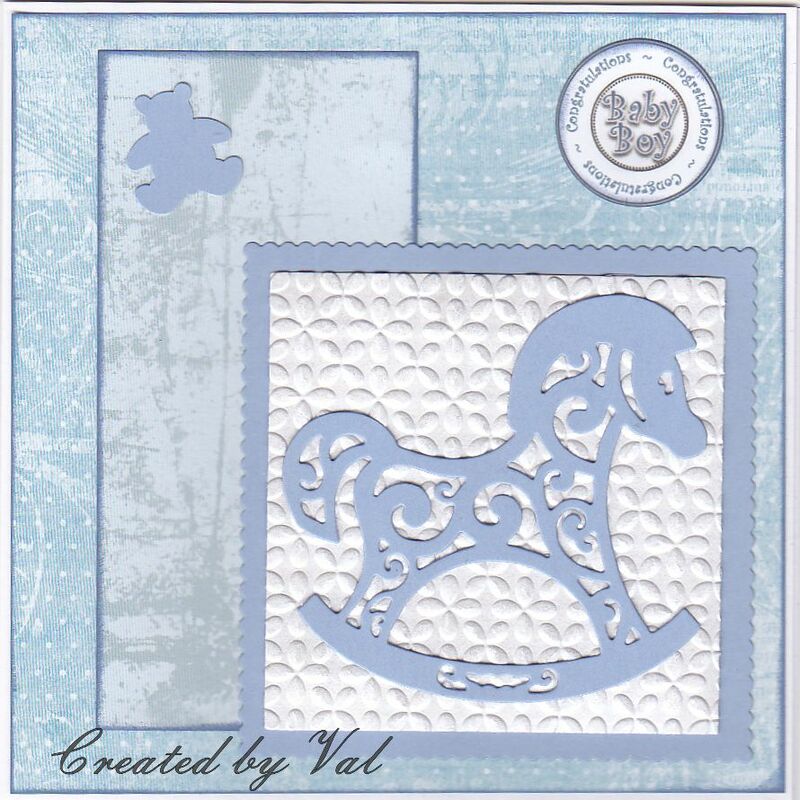 I've made two more baby cards for the box and this is the boy version in blue. Is it just me or does anyone else have problems trying to source - and match up - what I call true blue papers and card. I find that such a lot of the card around seems to be more of a pale turquoise rather than baby blue. This in itself would be OK but patterned papers seem to come in quite different shades of blue and are so difficult to put with the card. I've just found that pinks can be just as difficult to match papers to card - lots of card seems to be peachy rather than pink - sigh!! Anyway after much trawling through my stash I've managed to find enough card and paper which goes together to produce this card. The background papers are actually from a free book of double sided papers which came with a Christmas magazine and the blue card was a small card blank which has been lurking in a box for more years than I care to admit. 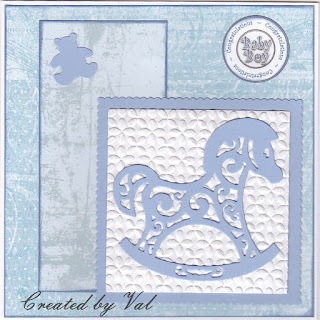 The rocking horse was a lucky find in The Works - well worth taking an occasional look at their selection of dies at very reasonable prices and they do cut well. The little teddy was punched out of the final scrap of the blue card using a punch I'd quite forgotten was in the drawer - does anyone still use punches nowadays I wonder??? I added a sentiment which was a free download from the generous Annette who has lots to offer on her blog. Do pop along and visit her blog to see some of her so lovely and beautifully coloured cards - she is a dab hand with Distress Re-inkers for colouring!! Having been card making for some years it is interesting to look at my stash and see just how things have moved on from the early days when it was 'punches and peel-offs', no such thing as all the wonderful dies and machines which we have available these days. This is so cute and I love the rocking horse and teddy bear! Great sentiment too, thx for sharing where you got it :) I haven't seen good matching blue papers since SU! retired their pretty baby blue color!